MfE is continuing to support the Resource Legislation Amendment Bill through the Select Committee process. The Bill was referred back to the Select Committee, as signalled in Minister Smith’s press release. The new report-back date for the Select Committee is 10 May 2017. However, the Committee may choose to report back earlier than that date. Timing of Royal Assent will depend on when the Select Committee reports back to the House and how quickly the Bill can move through the final stages of the Parliamentary process. MfE is rolling out a comprehensive implementation programme and throughout 2017, will work with RMLA, SOLGM, NZPI and other organisations to share information and best practice. MfE has requested council staff who are interested in receiving information and guidance directly, to provide MfE with the contact names and email addresses. The Hurunui/Kaikōura Earthquakes Emergency Relief Act 2016 and the Hurunui/Kaikōura Earthquakes Recovery Act 2016 are designed to ensure that urgent recovery works can be undertaken while still maintaining appropriate safeguards for the environment. The Act focuses on the immediate changes that are needed to enable those undertaking emergency works to focus on recovery efforts. Provides local councils with emergency powers to restore the Kaikōura harbours. MfE will be working with councils to support the implementation of the Act. For more information on this please see the Minister’s press release and the Act. The Hurunui/Kaikōura Earthquakes Recovery Act 2016 enables the Governor-General to make Orders in Council, on the recommendation of a relevant Minister, to exempt, modify, or extend provisions in certain laws in order to assist with the earthquake recovery. For more information, please see the Parliament website. MfE has also been working with earthquake-affected councils to identity what medium and longer term actions it can take to support recovery efforts. For more information contact Robert McClean (Robert.McClean@mfe.govt.nz or 022 067 6655). The NPS on Urban Development Capacity came into effect on 1 December 2016. A two day symposium was held in Auckland on 28 and 29 November to launch the NPS and to help shape the planned guidance and support from central government. Guest speakers included Environment Court Judges Newhook (Principal Environment Court Judge), Kirkpatrick (Chair of Auckland Unitary Plan Independent Hearings Panel) and Hassan (Deputy Chair of Christchurch Independent Hearings Panel), along with local authority officers, developers, economists and other technical experts. A lot of the discussion focused challenges of implementing the NPS and what government can do to help councils overcome these challenges. The project team will respond initially via the MfE website and through guidance, data and support over the coming months. Presentations will also be posted on the MfE website. Prior to Christmas, two working groups will be established to support local authorities in developing and monitoring indicators of price signals and to produce housing and business assessments. In the new year, these will be joined by groups working on guidance on the provisions in the NPS which refer to planning and consenting processes, as well as future development strategies. Further information on the implementation programme, including other planned packages of work, will be provided early in the new year. Queries should be directed to: npsurbandevelopement@mfe.govt.nz. A revision to the National Environmental Standards for Telecommunication Facilities (NESTF) was gazetted on 24 November 2016 and will come into force on 1 January 2017. The revision also widens the scope of areas where district plans may have more stringent rules than the original e.g. areas with identified visual amenity, historic heritage, cultural, landscape or ecological values outside the road reserve. You can find out more information on MfE’s website here. There has been a rumour circulating that the NPS on Natural Hazards is being fast-tracked as a consequence of the November 14 earthquake. MfE has confirmed that this is incorrect. MfE is progressing scoping work on a possible NPS for Natural Hazards, but this is subject to the Resource Legislation Amendment Bill passing. After Royal Assent of the Bill MfE will undertake targeted engagement on an issues paper to confirm the scope of the proposed NPS. In light of the November 14 earthquake MfE is also considering the wider role of land use planning for reducing risks to surrounding land and buildings, and has invited stakeholder input. Minister Bennett recently announced the establishment of the Climate Change Adaptation Technical Working Group. 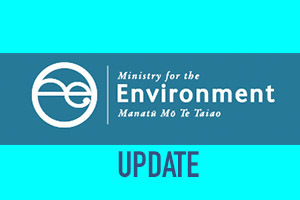 Now that the Group is established, the Ministry is looking ahead to the first report the Group will produce – a stocktake of existing work on climate change adaptation by both central and local government. To conduct this stocktake, MfE is reaching out to both central and local government agencies and asking them to complete a short template. This will be distributed to councils in mid-January. More details on the Group including the membership and terms of reference can be found here. Please contact Emma Lemire (emma.lemire@mfe.govt.nz or 027 338 8967) if you have any questions. The National Planning Template has undergone a name change to the National Planning Standards. The purpose of this change was to better reflect the final product sought. Click here to view a video on the parliament website of Minister Smith responding to a question from Sarah Dowie, National Party MP for Invercargill, about the National Planning Standards (skip to 5:01 for the question relating to the Planning Standards). MfE is still seeking participants, particularly regional councils, to help develop and/or test elements of the National Planning Standards. If you are interested in getting involved, please contact Helen Sharpe (helen.sharpe@mfe.govt.nz). Public consultation on the proposed amendments to the NESCS and the Hazardous Activities and Industries List (HAIL) closed in October. A total of 90 written submissions were received. MfE is currently summarising submissions and working towards the amendments being in place by mid-2017. DOC is undertaking a stocktake of the implementation and effectiveness of the New Zealand Coastal Policy Statement 2010 (NZCPS). DOC has surveyed local government on how they have given effect to the NZCPS and their views on its effectiveness, held workshops with national stakeholder groups, reviewed relevant case law and used case studies to explore some issues in more depth. A report to the Minister of Conservation on the findings of the work is anticipated early in the new year. Any decision on whether there should be a review of the policy direction and content of the NZCPS is outside the scope of the current work and is dependent on its findings. MfE is inviting all consent, policy and compliance managers to a joint TLA practice meeting mid-March 2017 in Wellington. This follows on from an initial meeting held in October 2016, with a sample of TLA managers. At that meeting, MfE discussed a variety of potential models for future engagement meetings with TLA practice managers. While no conclusions were made, it was agreed that a meeting where all council managers are given the opportunity to come along was necessary. With a large group of people expected, MfE plans to divide the day into group sessions and topic-based discussions. If you have suggestions for agenda items, please send these to Liz Moncrieff (liz.moncrief@mfe.govt.nz) or Robert McClean (robert.mcclean@mfe.govt.nz). MfE will confirm the date early in the New Year and will provide information about travel arrangements. MfE plans to engage with councils early in 2017 about changes to data requirements for the 2017-2018 period. These changes follow recommendations by external agencies to continue to enhance our data collection – including the Productivity Commission’s ‘Better Urban Planning’ draft report.